Useful for individuals, small groups, and churches, Joel presents a one-week study devoted to each chapter of the book and offers discussion questions, relevant Scripture, and insightful narrative to inspire readers to greatness. As people strive to go higher, rise above their obstacles, and to live in health, abundance, and victory. . .yet again, Joel guides the way. 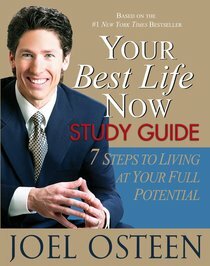 - Publisher Offering 100 days of motivational thoughts, inspirational messages, and Scripture verse, YOUR BEST LIFE NOW STUDY GUIDE is designed to help readers discover their inner strengths and abilities. About "Your Best Life Now (Study Guide)"